Black-headed Grosbeak observed and photographed 12 May 2003 at Cochise Stronghold, Cochise Co., Arizona, USA. The image is copyrighted by Robert Shantz. Only a few bird species found in Arizona's sycamore woodlands have such enlarged and heavy seed-cracking beaks. 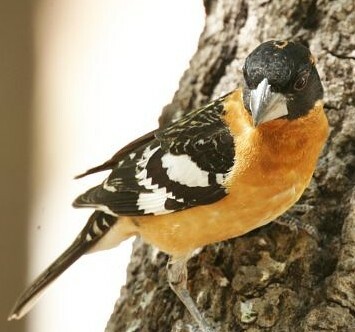 Black-headed Grosbeak males are orange or bright rusty color and have sharply black head and wing feathers. The beak is rather silvery. In females both the black and orange colors are muted allowing them good cover as they tend to the young. Black-headed Grosbeak is common through-out the American West and migrates to the northern tropics for the winter season. Diet-wise, grosbeaks lead a dual lifestyle. From autumn through spring their principal food is seeds. In spring and summer they switch largely to insects, which they require for feeding their nestlings. Whenever fruit is available it will be part of their diets.